Today we live in a hyper connected world where anyone has the ability to express an opinion, share a photo, or even share an hour long live video on how they prefer to assemble their peanut butter sandwich. Platforms like Facebook and Instagram have become ingrained into the fabric of a great majority of the population for staying connected with friends, family and businesses. For many people today, if it didn’t happen in their newsfeed it didn’t happen. Many use Facebook and other social platforms as their only connection to the Internet. The cost of print ads, in even the smallest of local magazines and newspapers, is still much more expensive than digital marketing. And most of us can remember phone book ads in the yellow pages, which can run a few thousand dollars a year or more. In this article, we will discuss the way we use to advertise our leathercraft business when we began in 2004 and how we leverage this age of social connection in 2019 to stay connected with our customers. Create products, services, and content that are quality and offer value… then promote these things to customers who can benefit from them. The only thing that has changed is where we market them. And the best place to market them is where our customers are the most. I was blessed when I started my business because the shop that I worked for and purchased already had a steady stream of local traffic. Jimmy Plantt had owned the shop for 6 years or better and offered a full line of products and services. Before that, the shop had two previous owners, so the history of a saddle shop on that side of town, in that particular location, was long. We always had a good supply of walk in traffic, so promoting our products and services on the retail floor was a productive way to market. In our community at that time, this was the only place in town to get a saddle repaired or look for a new set of handmade spur straps. In any new business, working to promote the business to the local population is the best bet. The local market is a good way to test the demand for a service or new product with little investment of marketing dollars. Taking advantage of our local market share proved beneficial for us to begin honing our skills and developing a following. We focused our resources on serving our local community and marketing where they were… local. We advertised in local magazines, sponsored local rodeos and events, and attended local craft shows. These are a great way to get in front of a set of people who are geographically close to your business who may be in need of your services. I think that starting with your local market share is a great way to build a foundation for your business. This allowed us to begin to develop our customer service policies as well as begin to dial in our pricing structure. Starting a leathercraft business and trying to figure out your customer experience, pricing, return policy, and all the other business areas of concern can take a lot of trial and error. Experimenting is much easier and cheaper if you keep it local and you are dealing with folks face to face… many of which you may know. As we began to expand and develop our business, we began to venture out a little. This was to expand on our customer base a little and get in front of some customers who didn’t know us. This was good to ensure that we didn’t exhaust our local clientele. We began to attend events and craft shows outside of our “local” area. We found quickly that these events came with a higher investment in both time and money. But we did see a good return from the majority of these outings. The thing that we learned with going to these shows and events was that we had developed products, services, and the policies to conduct them in a way that was attractive to the customer. Beginning to develop these things early with local clientele, helped us to put our best foot forward in a business like way at these events. This is important when meeting new people who don’t know anything about your business. Over time, we began to travel to farther away shows working to get our brand in front of even more people. With further distance came more investment. We got into higher quality shows and better events. We built a bigger booth and built more inventory for that booth. We invested in better equipment for getting to the events as well as for setting up the booth. There was financial investment, time away from our families, hours of driving time, nights slept in hotels or horse trailers, and hundreds of dollars spent on fast food. From a marketing perspective this was expensive. But if the show was successful we showed a profit for our sacrifices. At a minimum, we got our name in front of a lot of people that would have never known of us without these trips. We began to get our saddles in the hands of customers in new areas. This lead to new people from those areas calling and wanting our services. Even the trips that didn’t break even for us at the time, began to produce fruit. Sometimes it took a couple months. Sometimes it was a year or two later. This process of marketing made the most since to us at the time. We used the knowledge and skills that we had at the time to go where our potential customer was and put our best foot forward. Our only other option was to run ads in their area and hope they saw them. We decided to go to them and meet them in person where they were at different events and shows. During this time of traveling and doing print advertising, we began to see Facebook spread as a popular social media platform. I had a couple recent college graduates working for me and they were on Facebook to stayed connected with their friends and family. At this time facebook was only on the computer. That’s right, we didn’t have iPhones then either. Somewhere around this time, I created a Facebook profile for personal use. I began to add photos of some of my work to share with the few friends and family that I had on there. We slowly began to see how easy it was to share what was going on in the shop and to stay connected with our few customers that were friends with us on there. As time went on, Facebook became more and more a part of our business. Not in a big marketing way, but mainly as a way to post about a sale in the shop, something cool we had created, or for posting that we would be closed on a day for some reason or another. It was, at most, a “handy” little platform but not much more than that. As we began to share more, we began to gain more “friends” on Facebook. Over time, this sharing and connecting with our customers opened the door to a new marketing platform that is still a core marketing tool in our business today. Over the following years, a lot changed on the social media front for businesses. The iphone allowed us to post in real time without having to sit at a computer. The analytics got better. The algorithm changed and forced us to focus more attention to the way we advertised. Paid ads on these platforms taught us what worked and what didn’t. All of these changes have made marketing easier and harder at the same time. Other social platforms have come and gone since those early days. A few of them have become a part of our program. Our marketing strategy continues to evolve as the landscape of social media changes. In 2019, our Core marketing strategy is the same as it was in 2004. Only now we can go to where are customers are far more easily than ever before. Today our focus is still on the products and content. We create both physical leather products and saddles as well as create teaching products for those wanting to get into the craft of leather work. With both of these product lines, we are able to market to our customers right where they are… on their phones. The days of us going to trade shows or events is not completely over. But for me, with two children under five (as of writing this article), it is on hold for a now. The technology that is available today makes it very easy to create the most quality content that we can and get it in front of the folks it can benefit the most. I try to keep my marketing as simple as possible so that I can focus on creating content and bettering my skills to create better quality leathercraft products and saddles. With technology I am allowed to do that much easier than ever before. Our website is our home on the internet. This is where a customer can find anything “DG Saddlery” related. I think that this is the most important component of any business in today’s environment. I also believe this will always be the case. As leathercraft businesses owners and marketers, we do not own any of the social platforms. Facebook, Instagram, Twitter, Pinterest, and any future social platforms are owned by someone else. This means that we have to play by their rules and are limited to their exposure. The customers that correspond with us on these platforms are not our customers, they are that platform’s customers. A website is a property that you, as the business, owns and the only true way to have control over how your customers are treated and how their needs are fulfilled. Everything that we do on any social platform points back to our website. My goal is to go to where our customers are and show them what we have to offer that could help them. If they agree, then they will be lead to our website. This is my “digital” equivalent of them walking into my workshop. Now we are somewhat face to face and they can feel comfortable as they search for answers to their questions or try to find a product that we can make for them. This is more personal without the distraction of a screaming political news feed. Marketing in 2019 is completely different than it was in 2004. Marketing a business in 2029 will be even more different than it is today. Just in the last five years we have seen a huge growth in companies of all sizes adjusting their marketing strategies to incorporate the use of social media. Social media platforms have come and gone. Things that worked two years ago on one platform, no longer work today. The digital marketing arena moves faster than most of us can keep up with. So how do we, as small business owners, keep up with the changes and stay connected with our customers? The success of any marketing plan is not due to the fancy thumbnail photos, intricate sales funnels, expensive sales campaigns, attractive packaging, or even glossy full page print ads. If the product or service doesn’t solve a problem or fill a need for the customer, then no amount of discount or “Buy Now” attractant will make the marketing a success. Keep the needs of your customers as the main focus and work to create quality work. 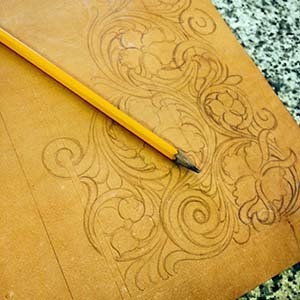 Your Work and Craft is paramount to creating success in the leathercraft business. The internet and social media make it easier than ever for a business to be started in less than a day’s time. Never before in human history has starting a business been so easy. But the quality of the product or service is still the thing that will carry the business to success. It is easy to get wrapped up in all the different ways to market a new leathercraft business online. Submerging ourselves in the apps, software, and social platforms to promote our business to as many potential customers as possible. Spending all of our time doing this will keep us from from focusing on bettering our skills, products and services. Focus on serving our Customer. Focus on perfecting our Skills. Focus on our Craft. Concentrating on these areas will, over time, create a demand for what you do in the marketplace. When this happens, the customers will help to guide you in your marketing strategy. They will tell you where you need to be because you will have what they want.